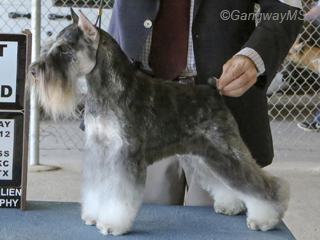 Ender finished from the puppy and bredp-by classes with three BOB over group- and BIS-winning special and a G4. He also won a Bred-by BIS along the way.. He is the seventh champion for his dam Ch. Gangway's Jacqueminot Jumpstart and the eleventh for his sire Ch. Repetition's Its A Rap. He is Gangway's 34th champion. He was bred, owned and shown by Bill Brown and Mary Jo Larsen.